What Day Of The Week Was December 6, 1982? 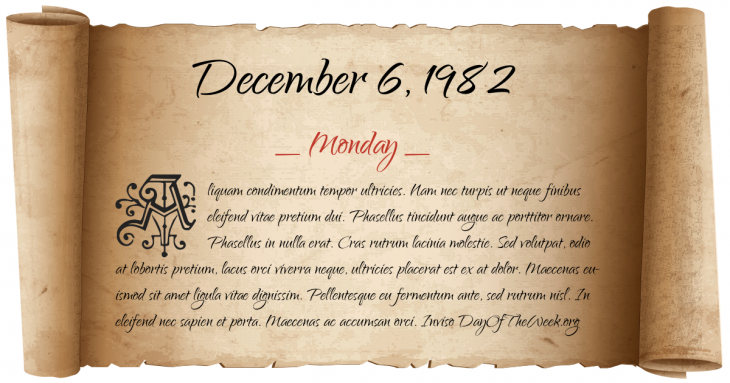 December 6, 1982 was the 340th day of the year 1982 in the Gregorian calendar. There were 25 days remaining until the end of the year. The day of the week was Monday. A person born on this day will be 36 years old today. If that same person saved a Nickel every day starting at age 3, then by now that person has accumulated $609.50 today. Droppin Well bombing: The Irish National Liberation Army detonate a bomb in Ballykelly, Northern Ireland, killing eleven British soldiers and six civilians. Who were born on December 6, 1982?